To best continue the theme of Jewish and/or Israeli connections that have now entered into this voyage by way of having met four Israelis while on the project at Victoria Falls (and if I had stayed another day I would have met a fifth -- the marketing people in Israel for that project must be really top drawer -- I went to the South African Jewish Museum & Holocaust Centre, conveniently situated as one of the stops for the hop-on-hop-off double-decker city tour bus that goes around Cape Town. I ended up spending about two hours there. Interesting, small museum and friendly people working there. I then got back on the bus up to the Table Mountain funicular base station and hung out at TM for a while since it was a clear, beautiful day with blue skies and few, if any, clouds. The next stop I was aiming for was Camps Bay beach, across from the Bay Hotel. 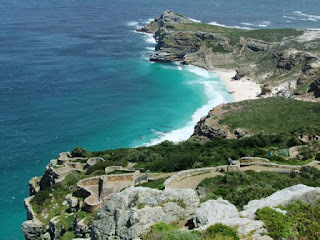 There I disembarked again and hung out in the sun on the sand for a while and then did the same at Clifton [3rd] Beach. I decided to keep walking up the coast to the next stop, rather than backtrack. It was a lovely sunset and the views were gorgeous. I hopped back on the city-tour bus at Sea Point so that I might get to the V&A Waterfront area before dark, as people say one shouldn't really walk around after dark. I saw in Lonely Planet that there was a Turkish restaurant in the same neighborhood where my home for the week was, so I went to check it out. At Anatoli I had way more food than was necessary, and the two glasses of SA wine I had helped send me right into an alco-food coma. After some non-touristic a.m. shenanigans (i.e. a long Skype conversation) were over, I headed out to stroll around the V&A Waterfront for a while. 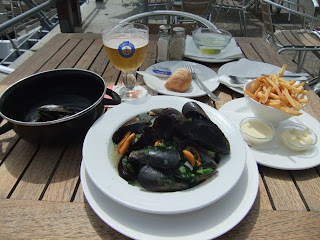 I had read in one of the in-flight magazines along the way about a Belgian restaurant at the Waterfront, so guess where I had lunch. The nostalgia for my time during the great Belgian Boondoggle and the trek through Flanders and Above was too great, so I heeded the call of Den Anker. 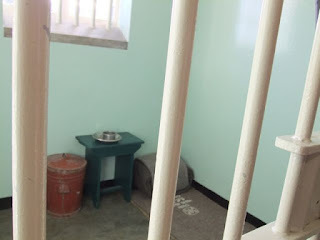 My sister-in-law Susan suggested the trip to and tour of Robben Island to see the former maximum security prison where Nelson Mandela (Mandiba) was held, along with countless other political prisoners during the old regime's control of South Africa. It was very moving to have Muthe (/mute/) a former political prisoner as a guide for the second half of the visit, speaking from personal experience about how people came to be there, what people endured there, etc. Since we were slated to be on the 6pm (last) ferry of the day to return to the Waterfront, people started getting antsy while Muthe was talking. Some even walked out. Why, you may ask? The final element of the tour is a stop in front of the cell where Mr. Mandela stayed while at Robben Island. The feeling I had once we were shortly thereafter ushered to where the cell was was very similar to the feeling I have had at The Louvre, observing the crowd gathered in front of the (tiny) Mona Lisa. 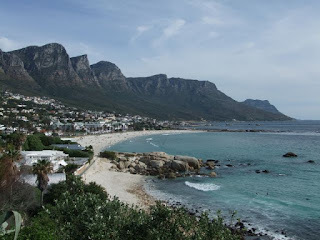 On Thursday I decided to go on an organized tour of the Cape Peninsula with African Eagle, starting on the Atlantic Coast, going south around the cape and up the False Bay Coast. As luck would have it, there was an American Jewish (one of whom was an Egyptian immigrant to the U.S.) as well as an Israeli woman on the tour. Almost needless to say, I was engaged in conversation with them at times chatting was appropriate or called for. I came to find out the the American woman's baklava is the best anywhere. Unfortunately, she did not have a sample with her for me to assess the validity of her claim. 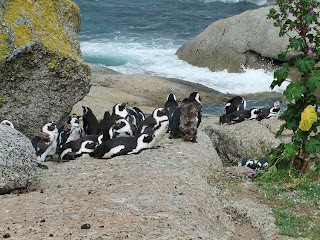 On our way back to Cape Town, we first stopped along the coast near Simonstown, where I saw some free range (aka wild) jackass penguins. No, the penguins are not called jackass penguins because they make particularly smart assy comments or annoy people excessively, Mike. Although I didn't hear them do it, they apparently make a sound similar to a jackass (donkey). 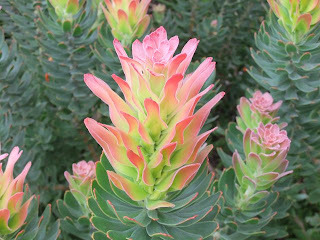 We then stopped at the Kirstenbosch Botanical Gardens in or near Constantia, which was the first wine growing area in the Cape. The KBG are beautiful and definitely worth a visit. I would love to see a concert or other performance in the amphitheater there on a nice evening, maybe with a bottle of wine from right down the road!